Earlier this summer, JPPM intern Sharon Osofsky studied artifacts from a mid-19th century privy in Baltimore. 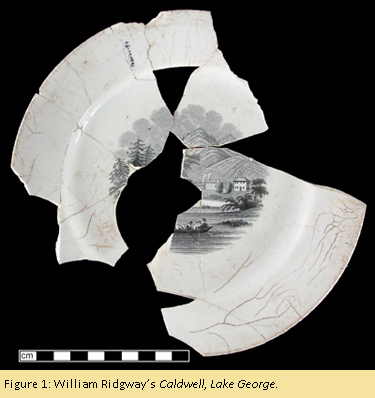 One interesting artifact tossed into the privy pit was a white earthenware plate printed with a scene of Lake George, New York (Figure 1). 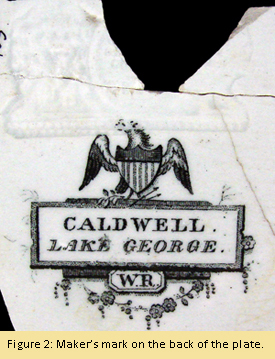 The back of the plate had a mark (Figure 2) that indicated that it had been manufactured by the British pottery firm of William Ridgway and Company. Manufacturer’s marks on pottery are great tools for the archaeologist – they help us date not only when the piece of pottery was made, but also when the entire group of artifacts with which it was found ended up in the ground. So Sharon used the standard “go-to” source for British pottery marks – Geoffrey Godden’s Encyclopedia of British Pottery and Porcelain Marks (1964), and got a date range of 1830 to 1834 for this particular Ridgway mark. We realized we had a challenge, however, when further investigation revealed that the print from which the lake scene was taken was not published until 1840! In that year, Nathaniel P. Willis published American Scenery: Or Land, Lake, and River Illustrations of Transatlantic Nature (Willis 1840). 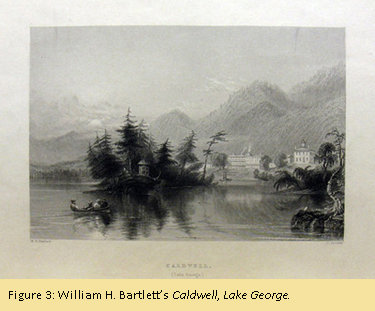 One of the illustrations in this book (Figure 3) was British landscape artist William H. Bartlett’s (1809-1854) 1837-1838 drawing of “Caldwell, Lake George” (William H. Bartlett Prints 2010). If William H. Bartlett was the first person to create a drawing of Caldwell, Lake George, then the dates assigned to the William Ridgway mark are incorrect and too early by one or more decades. Moore arrived in New Orleans in circa 1839 and began importing ceramics in late 1840 and his advertisement refers to Ridgway’s American Scenery Series, which included a number of famous American landmarks. It would appear that Godden’s narrow date range of 1830 to 1834 for this Ridgway mark was incorrect, with the mark continuing to be used into the 1840s. This reasoning makes perfect sense to me! Thank you so much to the Hahns for sharing their research. Godden is a great source and will continue to be my first choice when researching pottery marks, but I will be more careful to confirm his dates using multiple sources! 1964 Encylopaedia of British Pottery and Porcelain Marks. London: Barrie and Jenkins. “William H. Bartlett Prints 1837-1842.” New York State Library. Last modified April 06, 2010. http://www.nysl.nysed.gov/msscfa/pri5584.htm. 1840 American Scenery; Or, Land, Lake, and River Illustrations of Transatlantic Nature. London: George Virtue. This entry was posted in Archaeology, Artifacts and tagged archaeology, artifact, artifacts, baltimore, ceramics, collections, internships, Lake George, New York. Bookmark the permalink. ← 1812 Fair and Reenactment this Saturday. Come Early and Stay for Tavern Night!